Splitting from The Last Jedi discussion into its own thread. Edited by SHIELD Agent 47, 29 August 2018 - 02:53 PM. I could easily look this up myself, but since you've positioned the first post as a quick digest of "what we know so far," I'll just ask: who wrote and directed this one? J.J. Abrams and Chris Terrio are writing while Abrams himself is directing. At least that's the latest scoop. There have also been a few "Finn and Poe on a planet" pics leaked from filming that I won't describe but give a bit of a look at their costumes and at least one location. -ZacWilliam, I'm super looking forward to this, after all the surprise and awesomeness of Last Jedi I'm super interested to see where things go and how they climax. Minor clarification. Original announcement said footage from TFA, but apparently later stories have stated they'll be using unseen footage from both TFA and TLJ. i REALLY hope they don't backtrack on everything from "The Last Jedi" in a desperate attempt to placate Internet dipshits. The First Order will debut their latest superweapon; a giant cube. I REALLY hope they do. Recon the whole thing if they have to. I'm not a dipshit and I despise that movie. So how many Doctors is this now? 4 was the Bendu, 10 that Jedi robot, now 11 is something or other (probably nothing as visually wild as the other two), am I missing any? IX will be more mystery boxes. While not everyone who has issues with TLJ are dipshits (Some folks have legitimate complaints with the movie and the narrative direction), I find myself agreeing. TLJ threw us into the great, galactic unknown after decades of by-the-numbers Star Wars stories. It's refreshing being in a place where you don't know generally where the story is going to go. The last time Star Wars, specifically the visual media, was in such a place was 1983. Peter Cushing counts on the basis that the security guard companion from his second movie went on to be Donna Noble's grandpa. Edited by Rust, 30 August 2018 - 06:00 AM. Its so far away! get here faster. Oh hey, that's kinda neat. Last I looked the films are both uploaded on YouTube if interested. Is it reasonable to assume that the final title and teaser trailer will be released at Celebration 2019 a week from now? Edited by SHIELD Agent 47, 04 April 2019 - 10:50 AM. 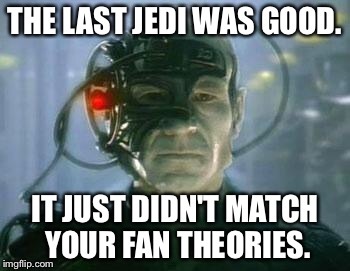 Got one of those for prequel haters?